Meteorites are always named for the places they were found,  usually a nearby town or geographic feature. In cases where many meteorites were found in one place, the name may be followed by a number or letter (e.g., Allan Hills 84001 or Dimmitt (b)). The name designated by the Meteoritical Society is used by scientists, catalogers, and most collectors. Most meteoroids disintegrate when entering the Earth's atmosphere. Usually, five to ten a year are observed to fall and are subsequently recovered and made known to scientists. Few meteorites are large enough to create large impact craters. Instead, they typically arrive at the surface at their terminal velocity and, at most, create a small pit. Several phenomena are well documented during witnessed meteorite falls too small to produce hypervelocity craters. The fireball that occurs as the meteoroid passes through the atmosphere can appear to be very bright, rivaling the sun in intensity, although most are far dimmer and may not even be noticed during daytime. Various colors have been reported, including yellow, green, and red. Flashes and bursts of light can occur as the object breaks up. Explosions, detonations, and rumblings are often heard during meteorite falls, which can be caused by sonic booms as well as shock waves resulting from major fragmentation events. These sounds can be heard over wide areas, with a radius of a hundred or more kilometers. Whistling and hissing sounds are also sometimes heard, but are poorly understood. Following passage of the fireball, it is not unusual for a dust trail to linger in the atmosphere for several minutes. 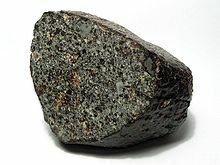 Most meteorites are stony meteorites, classed as chondrites and achondrites. 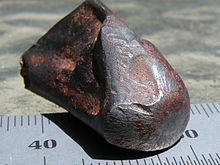 Only about 6% of meteorites are iron meteorites or a blend of rock and metal, the stony-iron meteorites. Modern classification of meteorites is complex. The review paper of Krot et al. (2007)  summarizes modern meteorite taxonomy. About 86% of the meteorites are chondrites,    which are named for the small, round particles they contain. These particles, or chondrules, are composed mostly of silicate minerals that appear to have been melted while they were free-floating objects in space. Certain types of chondrites also contain small amounts of organic matter, including amino acids, and presolar grains. Chondrites are typically about 4.55 billion years old and are thought to represent material from the asteroid belt that never coalesced into large bodies. Like comets, chondritic asteroids are some of the oldest and most primitive materials in the solar system. 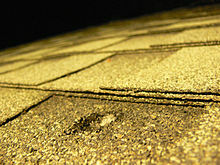 Chondrites are often considered to be "the building blocks of the planets". About 8% of the meteorites are achondrites (meaning they do not contain chondrules), some of which are similar to terrestrial igneous rocks. 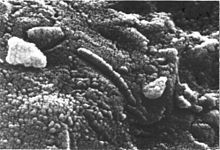 Most achondrites are also ancient rocks, and are thought to represent crustal material of differentiated planetesimals. One large family of achondrites (the HED meteorites) may have originated on the parent body of the Vesta Family, although this claim is disputed. Others derive from unidentified asteroids. Two small groups of achondrites are special, as they are younger and do not appear to come from the asteroid belt. One of these groups comes from the Moon, and includes rocks similar to those brought back to Earth by Apollo and Luna programs. The other group is almost certainly from Mars and constitutes the only materials from other planets ever recovered by humans. A small number of meteorite falls have been observed with automated cameras and recovered following calculation of the impact point. The first of these was the Přibram meteorite, which fell in Czechoslovakia (now the Czech Republic) in 1959. In this case, two cameras used to photograph meteors captured images of the fireball. The images were used both to determine the location of the stones on the ground and, more significantly, to calculate for the first time an accurate orbit for a recovered meteorite. At about the same time as meteorite concentrations were being discovered in the cold desert of Antarctica, collectors discovered that many meteorites could also be found in the hot deserts of Australia. 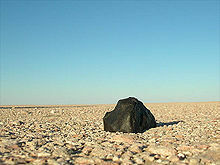 Several dozen meteorites had already been found in the Nullarbor region of Western and South Australia. Systematic searches between about 1971 and the present recovered more than 500 others,  ~300 of which are currently well characterized. The meteorites can be found in this region because the land presents a flat, featureless, plain covered by limestone. In the extremely arid climate, there has been relatively little weathering or sedimentation on the surface for tens of thousands of years, allowing meteorites to accumulate without being buried or destroyed. The dark colored meteorites can then be recognized among the very different looking limestone pebbles and rocks. 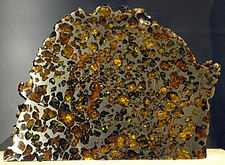 Meteorite markets came into existence in the late 1990s, especially in Morocco. This trade was driven by Western commercialization and an increasing number of collectors. The meteorites were supplied by nomads and local people who combed the deserts looking for specimens to sell. Many thousands of meteorites have been distributed in this way, most of which lack any information about how, when, or where they were discovered. These are the so-called "Northwest Africa" meteorites. When they get classified, they are named "Northwest Africa" (abbreviated NWA) followed by a number. It is generally accepted that NWA meteorites originate in Morocco, Algeria, Western Sahara, Mali, and possibly even further afield. Nearly all of these meteorites leave Africa through Morocco. Scores of important meteorites, including Lunar and Martian ones, have been discovered and made available to science via this route. A few of the more notable meteorites recovered include Tissint and Northwest Africa 7034. 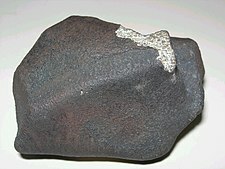 Tissint was the first witnessed Martian meteorite fall in over fifty years; NWA 7034 is the oldest meteorite known to come from Mars, and is a unique water-bearing regolith breccia. Beginning in the mid-1960s, amateur meteorite hunters began scouring the arid areas of the southwestern United States. To date, meteorites numbering possibly into the thousands have been recovered from the Mojave, Sonoran, Great Basin, and Chihuahuan Deserts, with many being recovered on dry lake beds. Significant finds include the three tonne Old Woman meteorite, currently on display at the Desert Discovery Center in Barstow, California. Other rare finds include the Los Angeles meteorite, a Martian meteorite,   Superior Valley 014 Acapulcoite, one of two of its type found within the United States,   and the Blue Eagle meteorite, the first Rumuruti-type chondrite yet found in the Americas. 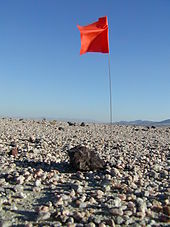 A number of finds from the American Southwest have yet to be formally submitted to the Meteorite Nomenclature Committee, as many finders think it is unwise to publicly state the coordinates of their discoveries for fear of confiscation by the federal government and competition with other hunters at published find sites. [ not in citation given] Several of the meteorites found recently are currently on display in the Griffith Observatory in Los Angeles. Meteorite falls may have been the source of cultish worship. The cult in the Temple of Artemis at Ephesus, one of the Seven Wonders of the Ancient World, possibly originated with the observation and recovery of a meteorite that was understood by contemporaries to have fallen to the earth from Jupiter, the principal Roman deity. There are reports that a sacred stone was enshrined at the temple that may have been a meteorite. 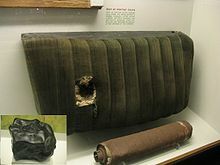 The Black Stone set into the wall of the Kaaba has often been presumed to be a meteorite, but the little available evidence for this is inconclusive. Although the use of the metal found in meteorites is also recorded in myths of many countries and cultures where the celestial source was often acknowledged, scientific documentation only began in the last few centuries. The first known modern case of a human hit by a space rock occurred on 30 November 1954 in Sylacauga, Alabama. A 4-kilogram (8.8 lb) stone chondrite  crashed through a roof and hit Ann Hodges in her living room after it bounced off her radio. She was badly bruised. 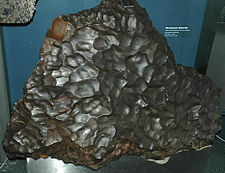 The Hodges meteorite, or Sylacauga meteorite, is currently on exhibit at the Alabama Museum of Natural History. Several persons have since claimed  to have been struck by "meteorites" but no verifiable meteorites have resulted. Allende, largest known carbonaceous chondrite ( Chihuahua, Mexico, 1969). ^ McSween Jr., Harry Y. (1976). "A new type of chondritic meteorite found in lunar soil". Earth and Planetary Science Letters. 31 (2): 193–199. Bibcode: 1976E&PSL..31..193M. doi: 10.1016/0012-821X(76)90211-9. ^ Rubin, Alan E. (1997). "The Hadley Rille enstatite chondrite and its agglutinate-like rim: Impact melting during accretion to the Moon". Meteoritics & Planetary Science. 32 (1): 135–141. Bibcode: 1997M&PS...32..135R. doi: 10.1111/j.1945-5100.1997.tb01248.x. ^ Bland, P.A. ; Artemieva, Natalya A. (2006). "The rate of small impacts on Earth". Meteoritics and Planetary Science. 41 (4): 607–631. Bibcode: 2006M&PS...41..607B. doi: 10.1111/j.1945-5100.2006.tb00485.x. ^ Maier, W.D. ; Andreoli, M. A. G.; McDonald, I.; Higgins, M. D.; Boyce, A. J.; Shukolyukov, A.; Lugmair, G. W.; Ashwal, L. D.; Gräser, P.; et al. (2006). "Discovery of a 25-cm asteroid clast in the giant Morokweng impact crater, South Africa". Nature. 441 (7090): 203–206. Bibcode: 2006Natur.441..203M. doi: 10.1038/nature04751. PMID 16688173. ^ Krot, A.N. ; Keil, K.; Scott, E.R.D. ; Goodrich, C.A. ; Weisberg, M.K. (2007). "1.05 Classification of Meteorites". In Holland, Heinrich D.; Turekian, Karl K. (eds.). Treatise on Geochemistry. 1. Elsevier Ltd. pp. 83–128. doi: 10.1016/B0-08-043751-6/01062-8. ISBN 978-0-08-043751-4. ^ Wasson, John T. (1 November 2013). "Vesta and extensively melted asteroids: Why HED meteorites are probably not from Vesta". Earth and Planetary Science Letters. 381: 138–146. Bibcode: 2013E&PSL.381..138W. doi: 10.1016/j.epsl.2013.09.002. Retrieved 1 December 2013. ^ Chan, Queenie H. S.; et al. (10 January 2018). "Organic matter in extraterrestrial water-bearing salt crystals". Science Advances. 4 (1, eaao3521): eaao3521. Bibcode: 2018SciA....4O3521C. doi: 10.1126/sciadv.aao3521. PMC 5770164. PMID 29349297. Retrieved 11 January 2018. ^ Ceplecha, Z. (1961). "Multiple fall of Příbram meteorites photographed". Bull. Astron. Inst. Czechoslovakia. 12: 21–46. Bibcode: 1961BAICz..12...21C. ^ McCrosky, R.E. ; Posen, A.; Schwartz, G.; Shao, C.-Y. (1971). "Lost City Meteorite–Its Recovery and a Comparison with Other Fireballs". J. Geophys. Res. 76 (17): 4090–4108. Bibcode: 1971JGR....76.4090M. doi: 10.1029/JB076i017p04090. hdl: 2060/19710010847. ^ Campbell-Brown, M. D.; Hildebrand, A. (2005). "A new analysis of fireball data from the Meteorite Observation and Recovery Project (MORP)". Earth, Moon, and Planets. 95 (1–4): 489–499. Bibcode: 2004EM&P...95..489C. doi: 10.1007/s11038-005-0664-9. ^ Oberst, J.; Heinlein, D.; Köhler, U.; Spurný, P. (2004). "The multiple meteorite fall of Neuschwanstein: Circumstances of the event and meteorite search campaigns". Meteoritics & Planetary Science. 39 (10): 1627–1641. Bibcode: 2004M&PS...39.1627O. doi: 10.1111/j.1945-5100.2004.tb00062.x. ^ Huss, G.I. ; Wilson, I.E. (1973). "A census of the meteorites of Roosevelt County, New Mexico". Meteoritics. 8 (3): 287–290. Bibcode: 1973Metic...8..287H. doi: 10.1111/j.1945-5100.1973.tb01257.x. ^ Golden, D. C. (2001). "A simple inorganic process for formation of carbonates, magnetite, and sulfides in Martian meteorite ALH84001". American Mineralogist. 86 (3): 370–375. Bibcode: 2001AmMin..86..370G. doi: 10.2138/am-2001-2-321. ^ Yoshida, Masaru (2010). "Discovery of the Yamato Meteorites in 1969". Polar Science. 3 (4): 272–284. Bibcode: 2010PolSc...3..272Y. doi: 10.1016/j.polar.2009.11.001. ISSN 1873-9652. ^ Harvey, Ralph (2003). "The origin and significance of Antarctic meteorites". Chemie der Erde. 63 (2): 93–147. Bibcode: 2003ChEG...63...93H. doi: 10.1078/0009-2819-00031. ^ Bevan, A.W.R. ; Binns, R.A. (1989). "Meteorites from the Nullarbor region, Western Australia: I. A review of past recoveries and a procedure for naming new finds". Meteorites. 24 (3): 127–133. Bibcode: 1989Metic..24..127B. doi: 10.1111/j.1945-5100.1989.tb00954.x. ^ Bischoff, A.; Geiger, T. (1995). "Meteorites from the Sahara: find locations, shock classification, degree of weathering and pairing". Meteoritics. 30 (1): 113–122. Bibcode: 1995Metic..30..113B. doi: 10.1111/j.1945-5100.1995.tb01219.x. ^ Schlüter, J.; Schultz, L.; Thiedig, F.; Al-Mahdi, B. O.; Abu Aghreb, A. E. (2002). "The Dar al Gani meteorite field (Libyan Sahara): Geological setting, pairing of meteorites, and recovery density". Meteoritics & Planetary Science. 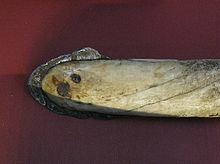 37 (8): 1079–1093. Bibcode: 2002M&PS...37.1079S. doi: 10.1111/j.1945-5100.2002.tb00879.x. ^ Prescott, J.R.; Robertson, G.B. ; Shoemaker, C.; Shoemaker, E.M.; Wynn, J. (2004). "Luminescence dating of the Wabar meteorite craters, Saudi Arabia". Journal of Geophysical Research. 109 (E1): E01008. Bibcode: 2004JGRE..109.1008P. doi: 10.1029/2003JE002136. ^ Jenniskens, Peter (1994). "The Mbale Meteorite Shower". Meteoritics. 29 (2): 246–254. Bibcode: 1994Metic..29..246J. doi: 10.1111/j.1945-5100.1994.tb00678.x. ^ P. A. Bland, M. E. Zolensky, G. K. Benedix, M. A. Sephton. " Weathering of Chondritic Meteorites"
^ Schmitz, B.; Yin, Q. -Z; Sanborn, M.E. ; Tassinari, M.; Caplan, C.E. ; Huss, G.R. (14 June 2016). "A new type of solar-system material recovered from Ordovician marine limestone". Nature Communications. 7: 11851. Bibcode: 2016NatCo...711851S. doi: 10.1038/ncomms11851. PMC 4911632. PMID 27299793. Retrieved 9 September 2017. ^ J. Borovicka and P. Spurný; Spurný (2008). "The Carancas meteorite impact – Encounter with a monolithic meteoroid". Astronomy & Astrophysics. 485 (2): L1–L4. Bibcode: 2008A&A...485L...1B. doi: 10.1051/0004-6361:200809905. ^ Ashley, J. W.; et al. (July 2011). "Evidence for mechanical and chemical alteration of iron-nickel meteorites on Mars: Process insights for Meridiani Planum". Journal of Geophysical Research: Planets. 116 (E7): E00F20. Bibcode: 2011JGRE..116.0F20A. doi: 10.1029/2010JE003672. hdl: 1893/17110.